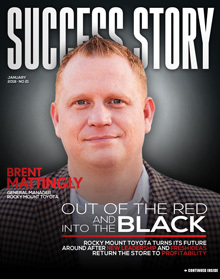 Despite these challenges, Mattingly and his team at Rocky Mount Toyota, located in Rocky Mount, North Carolina, have not only stopped the financial bleeding but are on track to be in the black to the tune of seven figures by the end of the year. The store, previously known as Bobby Murray Toyota, was purchased in August 2016 and became the 13th store in the Hudson Auto Group. Mattingly, who had been working as a GM in Southern Indiana, was brought on board. He knew he had some work ahead of him, but he also saw the potential. from a lack of vision from the top rather than problems with the staff. With a plan set in place, everyone was able to keep their jobs in the transition. 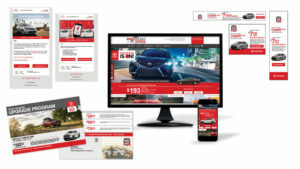 No matter how well the staff prepared, though, the dealership’s leaders knew that getting the word out to the surrounding market was crucial to building a successful business. Although the dealership was well known by customers in the area — at 30 years, it was one of the longest-running dealerships in the region — its marketing had lagged behind. Rocky Mount Toyota’s message needed to be refreshed and reimagined. 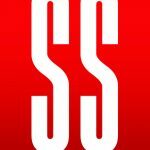 In any modern dealership, the service department is essential for not only repairing and maintaining customer vehicles but for maintaining a future relationship with that customer as well. Rocky Mount Toyota is in the finishing stages of constructing a state-of-the-art facility, but that has led to its own set of challenges, especially for its service department. Once the customers are in, the processes that Mattingly’s team put in place come into effect to give each customer a complete service experience “We have a service manager T.O. every customer in the service department, presenting menus and presenting all their options,” he said. Add to this the vehicle exchange program put into place in the service department, and the dealership has maximized this valuable profit center.